Normally I do not sue, but this seems to me a special case. 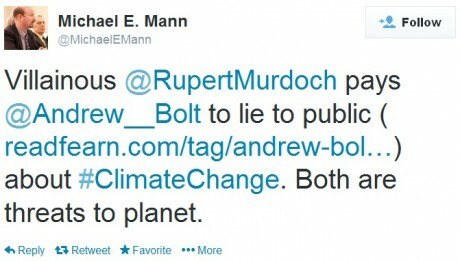 Mann, the climate alarmist who gave the world his dodgy ”hockey stick”, is now suing sceptic Mark Steyn for mocking him and his lawyers have produced deceptive legal documents in his defence. Mann has published an outright lie that defames me, and should face the same punishment he wishes to mete out on Steyn for mere mockery. I do not lie and Murdoch does not pay me to do so. Nor has Mann singled out a single “lie” I’m alleged to have committed. In fact, Mann is so reckless with the facts that his tweet links to an obvious parody Twitter account run by one of my critics, clearly believing that it’s actually mine. Warning to Michael Mann: apologise for your lie or risk facing from me what you’ve done to Steyn | Herald Sun Andrew Bolt Blog. MUST READ also : Steyn et al. versus Mann | Climate Etc. You have published an outright lie that defames me. I do not lie and am not paid by Rupert Murdoch to lie. You have not identified in your tweet a single example of an alleged lie, which suggests you simply made up this defamatory claim. Indeed, you were so reckless with the facts that your tweet links to an obvious parody Twitter account run by one of my critics which you have clearly believed is mine. Your other link is to the website of a warmist journalist who for years was a Murdoch columnist, too, writing on climate change. Was he, too, paid by “villainous” Rupert Murdoch to “lie to public”? I’ve since learned that you last year retweeted another defamatory comment: “No other media organisation in any other civilised nation would employ #AndrewBolt as a journalist”. As it turns out, that, too, is incorrect. I am not only employed by News Corp but by Australia’s Network 10 and Macquarie Radio Network, where I host a weekly television show and co-host a daily radio show respectively. I have also appeared as a commentator on other media outlets, including the state-owned Australian Broadcasting Corporation, Al Jazeera, the BBC and Canadian radio stations. I am very confident I would be able to find work as a journalist in another “civilised nation”. I note this because repeated defamations under Australia’s law is evidence of malice – and your history of defaming me shows a complete disregard for the facts. It is appalling that you could be so reckless, so spiteful, so destructive and so ill-informed. I have long doubted the rigor and the conclusions of your work as a climate scientist and often deplored the way you conduct debate, but even I had never before today considered publically calling you a liar. I demand you delete your tweet and issue a public apology on the same Twitter account within 24 hours. Failure to do so will not only cast doubt on your commitment to truth in debates on global warming, but expose you to legal action. Too late. His mask has slipped. What else has he repeated – whether “science” or personal calumnies – that was false and motivated by spite or self-protection? Steve McIntyre suggests one more. Now, how to get Mann to apologise for his “hockey stick” as well? To help Mark Steyn meet the legal bills in his own legal battle with Mann, please go here and go to the final link. It’s a “jump the shark” moment for Mann. Satellites show that California sea level has been falling slightly since the start of records in 1992. This entire climate conversation is a bunch of contrived BS, with idiotic words like “forcing” We don’t push the climate around, the climate pushes us.